Quite rightly the ANZAC Troops are given much coverage in the remembrance of the anniversary of the Gallipoli Campaign, but it shouldn’t be forgotten that many thousands of British and Commonwealth Troops from other countries also took part in the campaign. This is the story of one of them, from a South London Cockney Family Tree I traced a few years back. The Blackmore’s had lived around the Elephant and Castle, a rough part of South London, they were working class Cockneys, so the idea of escaping to sea was a very attractive proposition for the boys of the family and the 18 year old Alfred Blakemore joined the Royal Navy on 27th June 1898 for a twelve year period, he was 5ft 6ins tall with brown hair, brown eyes, and a fresh complexion. he is soon posted to HMS Rosario a Condor class Sloop built in 1898, she was a steam ship driven by twin screws but she was also equipped with barque rigged sails. However, after the loss of her sister ship The Condor in a gale, it was decided that the ship had gone down partly due to the encumbrance of her masts, sails, and rigging, and so the admiralty removed all such from the Rosario at about the time that Alfred joined her, no more ships were constructed to such a mixed design. She was armed with six 25lb and four 3lb guns, all quick firing breach loaders. In reality she was out of date as a battleship in European waters, but still had a valuable role as a patrol ship against less advanced enemies of the Empire. 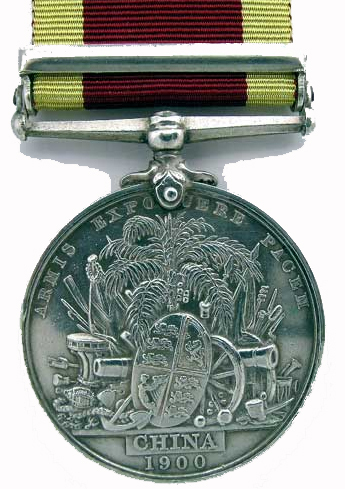 Her opportunity came when she replaced an older ship HMS Rattler on the China station at the time of the Boxer Uprising (made famous in the film “55 Days in Peking”), Alfred was awarded The China Medal for his service against the Boxers in China. He stayed on Rosario in Chinese waters for the next three years. Right forearm – crossed flags, star, heart pierced by an arrow. Left forearm – AB.I.L.F.C.KF.I.L.A.B.A. and an anchor. The Star was a good luck symbol to ensure the sailor could always follow his star to get back to his home port, the heart was for a sweetheart, the anchor for an Atlantic crossing, and the letters to denote rank (Able Seaman) and various ports of call. Then comes the Great War, and Alfred is straight back to a recruiting office to join up. 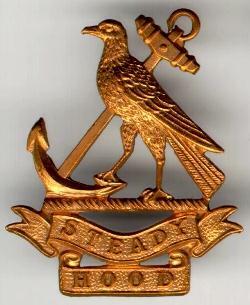 Fortunately for a man in his mid thirties, the Admiralty authorised the formation of the Royal Naval Division to act in amphibious operations in any theatre of war and its recruits were initially drawn from a large number of volunteer Stokers like Alfred from the Royal Fleet Reserve, as well as other Naval Reserve personnel, when the Navy withdrew some of the men to regular naval units, the Division was reinforced by soldiers from Yorkshire, Durham, and Northumberland. These men were formed into two Brigades officered by a mixture of Army, Navy, and Royal Marine Officers some of whom had been on active duty, others were formerly retired. Alfred was in the Hood Battalion (known as the “Steadies”) part of the 1st Brigade. 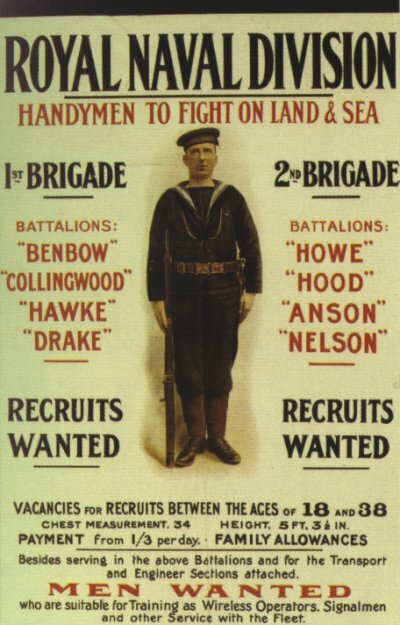 So consisting of older men like Alfred (35), some called back out of retirement, very few of whom had experience of combat before, the RND was a “Cinderalla” Division, lacking services, transport, and signals, not helped by the Navy continuing to pull out men to fill posts in ships thereby crippling training and unit cohesion. During October 1914 the Division had a chance to see action when, they were sent to Antwerp to reinforce the Royal Belgian Army who had been mauled by the Germans and forced to retreat to the fortified city of Antwerp. This was the first time that the RND had been together in one place, and the first time that most of their personnel had been in combat. The plucky stokers were fed into a City on the verge of collapse. The Belgians had bravely mounted attacks from Antwerp against the Germans’ exposed right flank as they marched towards the British and French lines in Flanders and Northern France, this had forced the Germans to detach a number of Divisions to guard their flank, as well as artillery to try to reduce Antwerp. Winston Churchill realised that if the channel ports fell into German hands then that would constitute a major threat to Britain, so he pushed for a body of men to be sent across the channel to reinforce the Belgians and make a show of strength around the ports. At the eleventh hour he got his way, and a small regular force was dispatched as well as Royal Marines, and the RND who were sent forward to Antwerp to reinforce the Belgian defence of the city, along with them went the Royal Naval Air Service with six aircraft, ten touring cars fitted with ad-hoc armour and machine guns (the first time Armoured Cars were used in Warfare) and ten lorries. This force was too small to save Antwerp but did delay its fall and allowed the Belgians to withdraw down the coast to new defensive positions covered by the Britsh regulars. The RND withdrew with the Belgians, Alfred being lucky in as much as his Battalion withdrew directly towards allied lines and the safety of ships back to Britain, whereas 1,500 men of the RND including the Brigade Commander of the 1st Brigade, accidentally crossed the Dutch border during the retreat, and were captured and interned by the Dutch (The Netherlands being a Neutral State for the duration of the Great War). What Churchill’s “Marine Promenade”, as the amphibious landing of the Marines and RND was disparagingly called, did achieve was to distract and unnerve the German High Command, forcing them to keep large numbers of troops in the Antwerp area to deal with the Belgian army and their expected reinforcements from Britain. This lead at least in part, to the subsequent German retreat at the Marne, which changed the whole shape of the war by stopping the German advance on Paris in its tracks, and thereby prevented them from winning a quick victory as they did in the Second World War, and changed the course of subsequent history. In turn the tieing up of German forces in the attack on Antwerp allowed the allies to hold the Germans in the desperate defensive battle of Ypres. The reason for the effect of the “Marine Promenaders” being out of all proportion to actual numbers or achievements on the ground was that, as is common in war, the numbers of reinforcements landed were greatly exaggerated in German intelligence. The few thousand Marines and RND being thought to be as many as 40.000 men, and there is even an amusing legend of a cockney night porter at a London station, having heard Gaelic speaking soldiers travelling by train to the coast, spread a rumour that the Russian Army had arrived to reinforce the Belgians! This rumour grew and found its way to German Intelligence, grew some more, until it was reported that a Russian Expeditionary force of 80,000 men was heading for the Belgian Ports. General Sir Basil Liddell Hart when writing his seminal History of the First World War, with tongue firmly in cheek, called for the erection of a statue of “The Unknown Porter” in Whitehall! So, although the RND’s exploits at Antwerp may be listed in some histories as a defeat, Alfred and his brawny Stoker mates (along perhaps, with a cockney night Porter) helped give the German High Command enough of a fright to change the course of the War, and thereby the whole course of history. Few men can make such a claim and you should be rightly proud of Alfred. But the war was far from over for Alfred. He had now seen active service in China, and Belgium, but his biggest and most dangerous venture was about to unfold on another distant shore. On his return from the Marine Promenade in Belgium he spent some time undergoing further training with his unit at Blandford, and would have been under the command of officers such as the famous war poet Rupert Brooke and Arthur Asquith, the son of the prime Minister, so quite illustrious company. The training lasted a few months, and Alfred got into a spot of trouble late in February 1915, finding himself deprived of eight days pay and eight days leave, the day after he went back onto pay at seven fifteen on the evening of 27th February 1915 his battalion marched out of Blandford Camp dressed in tropical pith helmets in the pouring rain. They marched through the night and the rain, entertained by the mules in the supply train causing chaos for the transport officer, and eventually reached their transport at 3.30 in the morning. The train took them to Avonmouth and The Grantully Castle steamer that would sail them to the Middle East. The sailed that afternoon 28th February 1915, with the Battalion buglers playing a farewell to the officer’s relations and sightseers on the dockside. They made their way to Egypt, a British protectorate at the time, for training and acclimatisation, and then set off for the Dardanelles. En-route the poet officer Rupert Brooke seems to have been bitten by a mosquito and died on 22nd April 1915. The battalion made a short detour to the Greek Island of Skyros, where, with full military honours he was buried in an Olive Grove. Touching as this scene was, it was the last interlude of civility before the horrors of the Dardanelles, and bore little relation to the fate awaiting the “other ranks” when they fell. By May the RND were ready to be sent forward to take on the Turks in what would become known as the 3rd Battle of Krithia. The allies were attempting to clear the Gallipoli Peninsula at Krithia by overrunning the Achi Baba heights and clearing the Turkish guns that commanded the land and seaward approaches to Istanbul. Capture the Turkish trench system. Gain another 500 yards passed this and re-entrench ready for the next Campaign phase. There would be an initial bombardment of the Turkish lines followed by a feint attack by the British forces to draw the Turks forward into a second artillery barrage after which the Allied Infantry would launch their real attack, the RND for their part charging up the main Krithia Road and then along the Achi Baba Nullah (known as Bloody Valley) supported by the machine guns of the Royal Naval Air Service (RNAS) armoured touring cars (who had been with them at Antwerp) on Krithia Spur. On their right attacking up Kereves Spur were the French, and their left was supported by the Indian and Regular British Divisions coming up Gully Ravine and Spur, and Fir Tree Spur. Alfred and the RND drew up inside their sandbagged trenches on the morning of the 4th June 1915, according to men who took part tension was high, this was the first time that they had gone over the top into the face of enemy fire under a blazing sun, they fiddled with their rifles, sharpened already razor sharp bayonets to relieve the tension, some wrung their hands, some prayed, others watched the masses of maggots that crawled along the sandbags inches from their faces. The bombardment went well, the pause came and the ruse worked; Turks came out from rear lines and cover to face the ex pected attack of the Allies, only to be greeted with another bombardment which killed six thousand of them, Alfred and his pals would have watched this spectacle, some with sorrow for the men blown to bits, but most with relief knowing that each dead Turkish soldier was one less rifle to shoot back when they went over the top. 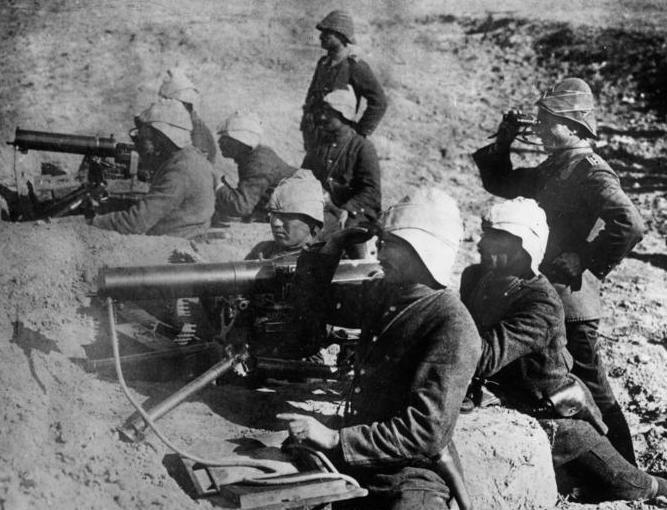 All feelings of sympathy disappeared when the Turks answered back with their own bombardment of the British positions, men’s spines went numb with the shockwaves of shells, then it stopped. The officers’ watches showed noon, and with the Sun at its zenith Alfred went over the top in grim determination with the Hood Battalion and the 2nd Naval Brigade walking out rifles at the ready walking tall like veterans, making a beeline for the shattered Turkish trenches. They ran up the Nullah at the steady double, shells exploding overhead, jumping over the bodies of the fallen, past the steady stream of wounded hobbling back for treatment. Bullets whizzed by, the Armoured cars rushed up the road towards the Turkish positions and emptied their magazines into the line of defenders dazed and crouching in their trenches, this gave Alfred and “The Steadies” the chance to make the trench line firing their Lee Enfields from hip and shoulder, bayonets gleaming through clouds of dust they jumped into the trenches and had at it with the Turks bayonet to bayonet, the defenders broke and ran and the trenches rang to the blood stained cheers of The Steadies. Now they had a chance for a brief respite, Alfred and his mates had gained the first objective, now the Collingwood Battalion RND came up at the run and surged passed them to push the advance to the Achi Baba heights, the Steadies cheered them on and waved their pith helmets to give them encouragement. They watched in anticipation, but to their horror saw that the set up a flanking fire from Kereves Dir over on their right, the French advance had stalled, and the Turks had free range to cut down the Collingwoods, the cheering of the Steadies was silenced, they watched in horror as the Collingwoods were cut to pieces, the whole Battallion was annihilated. The Steadies were whistled up by their officers, and counter attacked with the rest of the RND to take the next line of Turkish trenches, but they were too late for the Collingwoods, the Battalion was never reformed. Charging in where the Collingwoods had failed the exhausted Steadies shot, stabbed and clubbed with rifle butts until the Turks were pushed back, jumping into a trench with bayonet fixed, Alfred roared and thrust out his steel blade, but the fire from the Turks on the higher ground whistled and zinged around his ears until a Turkish bullet tore through the front of his jaw and out throw his neck, knocking him clean off his feet. Barely conscious and bleeding his mates dragged him into the newly captured Turkish trench and dressed his wounds while they waited for reinforcements from the flanks. The French Senegalese Troops had failed on the right, on the left the Gurkhas had advanced and taken some ground, but the rest of the Indian Brigade had been badly mauledand halted, including the Ferozepore Sikhs had been trapped in Gully Ravine and almost wiped out. The Hampshire Regiment advancing on the high ground next to the Sikhs had gained ground, but now like the RND, were cut off in a salient having to defend on three sides simultaneously. In the centre next to the RND the Manchester Regiment had taken their objective, routing the Turks and capturing over 200 of them. But everywhere else the lines where held by the Turks cut through with small enclaves of nearly surrounded allied soldiers. The Generals then decided to commit their reserves, but rather than reinforcing and exploiting the success of the Manchester Regiment of the 42nd Divison in the centre next to the RND, which would have allowed them to cut off the Turkish Flanks, the Generals decided to commit the cardinal military sin of “reinforcing a failure”. They sent the reinforcements to their failed flanks, where the French refused to attack again, and the second attempts at advancing up Gully Spur with the Indian Divisions were again beaten back. The Manchesters were counter attacked by the Turks and almost completely cut off before being forced to retreat. The failure of the French to re-engage on the RNDs right, and the lack of reinforcements to the 42nd on their left, meant that any hope of the RND renewing their attack to overrun the Achi Baba heights would be impossible. Staying pinned down in the killing zone of their captured salient was not an option, so, two hours after charging from their trenches, the Steadies, with Alfred semi-conscious and carried by his mates, were forced to return to their starting positions before the battle. Men trudged back oblivious to the shot and shell that burst all around them, fatalistic in the belief that if it had your name on it you’d get it. When they reached their lines Alfred and the other casualties were passed down the long line to the medical tents on the beach, and The Steadies fell into their trenches dog tired, battered and bruised, and slept where they lay in the sand exhausted by their efforts, and oblivious to the chaos around them. The chance to overrun Achi Baba and turn the course of the whole Dardanelles Campaign had been lost, the allies gain about 250 yards of ground for the loss of thousands of men. In some ways Alfred was one of the lucky ones, as his part in the ongoing bloody conflict of the Dardanelles campaign was over. As a postscript, the Turks themselves had received enormous casualties in the fighting, and Turkish Generals believed that if the allies had renewed the attacks the following day, the Achi Baba heights would have fallen. Instead the Allies stood on the defensive, giving the Turks a chance to regroup and counter attack, two days later on the 6th of June they attacked the Hampshire Regiment, who had fought so well on the 4th, in “The Vineyard”, the Hampshire’s morale was so low that a rout was only prevented by Second Lieutenant G.R.D. Moor drawing his revolver and shooting four of his men dead to make the others stand and fight, he was given the VC for his action. Bad Generalship had broken the men’s morale. Lions were led by Donkeys. Alfred was put aboard the hospital ship Ascania, but by the 11th June it was clear that he would not be fit for service anytime soon, so he was shipped out to the ex-Greek Hospital of Glymenopoulo in Alexandria reaching it on 29th June 1915, admitted as having a Gun Shot Wound (GSW) to the face and Bullet wound to Neck. Two weeks later, once it looks like he will survive, his next of kin are informed of his wound. He leaves hospital on 12th July 1915 to Mustapha Base in Egypt and by 1st August he is on board Transport ship HMT Sudmark for shipping back to his unit, but by the 18th August his wound flares up and he is given treatment by an ambulance unit, followed by a bout of dysentery on 28th September, which of all his suffering turns out to be the thing that gets him his ticket home aboard the HMS Nevasa First to Malta on 4th October, and then aboard the HS Regina D’Italia (Italy being allies during WW1). His next of Kin are not informed of these movements, and he was in Haslar Hospital at Portsmouth for treatment before his wife and Parents were aware of his situation. From here he was transferred to a RN Reserve Battallion, and given leave to see his family which must have been an incredibly emotional time. Alfred would have walked home from the train station, a thin scarred man, gradually getting his fitness and health back, his wife and parents must have gone through a whole series of emotions from relief of his having survived such a horrendous time, to grief at the state of him and the wounds he bore. But time was short, and by the end of November he was back at the camp at Blandford, where he was given his Good Conduct Badge back (which he had lost after having been put on a charge immediately prior to shipping out to the Middle East), as well as a duplicate of his China Medal which he had not received previously. In the New Year of 1916 he is transferred from Blandford to Chatham for Sea Service on 28th January 1916. From March to December 1916 he is aboard HMS Intrepid, a depot ship, but he was moved off of her before she was sent to the Russian White Sea in 1917, Alfred went ashore to Pembroke Barracks, until taking up his final posting aboard HMS Actaeon from January 1917 to January 1919. Actaeon was the shore based Torpedo Training School at Sheerness; it was a soft but honourable posting for a man of 40 who had done so much in the service of his country.